Many ancient peoples understood that the horse was more than just an animal at their service for war, transportation and work. However, its therapeutic function had never been studied until the mid-twentieth century, when they began to be used for the rehabilitation of illnesses involving physical and mental disability. Argentina has been a pioneer in the implementation of this type of therapy. 36 years ago, when Maria de los Angeles Kalbermatter first started out, it was only known in Europe and the United States, and even there without much acceptance. After the amputation of her leg at age 27, she chose to rehabilitate herself through horse riding, something that was previously unprecedented. Over the years, not only did she demonstrate her success, but she also began to teach children with different illnesses to practice and experience the same results as her. "The only people who believed in this were those who loved horses. 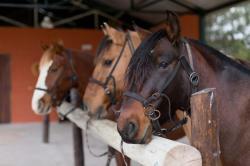 Today, 38 years after I founded the first equine therapy school in Latin America, I feel proud. The school has drawn all types of patients: The vast majority with serious disorders, but in recent years we have also received patients who have suffered strokes, depression or stress. Students who, when connecting with the horse, discover the healing power of this wonderful animal," she says. 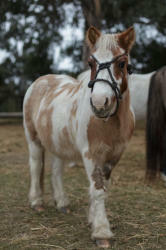 Today more than 250 centers throughout the country practice equine therapy. This therapeutic method was first implemented for patients suffering conditions linked to serious motor and neurological disorders, and has had excellent results with autism. These centers are mostly run by nonprofit associations or foundations financed by sponsors, or through municipal or lottery contributions; as is the case for La Plata School of Equine Therapy for People with Disabilities and Special Needs. Other riding schools charge a small fee and when possible, offer scholarships to people who cannot afford to pay. Social security and some prepaid health insurance issuers will cover the cost of the treatment, but in many cases it is necessary to make a request to the state to ensure they do this. "Equine therapy is based on three basic principles: the transmission of body heat, rhythmic pulses and a pattern of movement equivalent to that of the human gait. The horse is a being capable of healing through both emotion and body language, and serves as a mirror to the human soul," explains Julieta Malleville, director of the La Paloma School of Equine Therapy, in the city of Tandil, located 300 kilometers from the Federal Capital. The horses used for equine therapy in Argentina are either criollo (creole) or crossbred horses that are no taller than 1.60m in height and are between 8 and 15 years old. They must be docile by nature, which gives both the therapists and patients the total confidence required in order to work with and trust them. They should not be easily startled and should be familiar with all of the instructional materials used at the school: hoops, balls, bars, bubbles, music, maracas and stuffed animals. In the last 15 years equine therapy has evolved and has been put into practice to treat diseases such as stress, depression, phobias, addictions, obsessive-compulsive disorders and eating disorders. This type of treatment is called psychotherapy with horses and it is complemented by traditional medicines and therapies. Such is the case of Viviana Espejo, who suffers from bipolar disorder. She lives in Tandil and when she started taking her daughter to the city's horse-riding center, she realized that contact with the horses made her feel much better. "When the time comes to ride an animal, handle the reins, control its movement - my mind focuses on those activities and I think of nothing else. All my thinking is concentrated there, on handling the horse and enjoying my relationship with it. They are very noble beings, they will never hurt you," she says. The psychotherapy sessions are performed next to, not on top of the horse. It is not necessary to have previous experience of riding and the relationship with the animal is based on different activities proposed by a therapist, according to the patient’s condition. Sessions last between 30 and 45 minutes, ideally weekly. In the province of Salta in the north of Argentina, 13% of the population is affected by a form of disability. For Elena Cataldi, founder of the Equinoterapia del Azul Foundation, “it’s possible for the rehabilitation of a disabled child to be carried out in a context of joy, freedom and contact with nature.” She’s all the more convinced by the technique for having seen her own disabled son regain his motor skills thanks to the therapeutic power of horses. Launched in 2005, her foundation, which also offers a day centre and social inclusion workshops, provides therapy for more than 80 children each year. 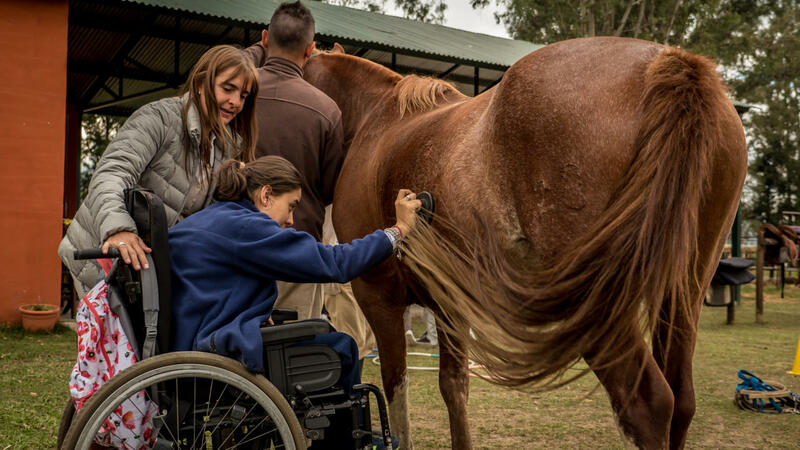 The physician Veronica Settepassi, who has been working for 15 years at the Hipocampo Equine Therapy School in the Palermo neighborhood of Buenos Aires, says that equine therapy helps people to control their fears and connect with the environment. "The movement of the horse reconciles the person with their body, it makes them feel good. I had cases of people with depression and eating disorders that showed very rapid improvements. The difficulty with promoting this complementary therapy is that families often only opt for the treatment as a last resort. Regular and constant care over time is essential in this type of activity and if patients do not have the necessary support, they leave straight away," she says. This school stands out due to the number of professionals who are available for interdisciplinary work. The team at Hipocampo, coordinated by Settepassi, herself a physician, consists of two occupational therapists, two psychologists, a psychomotor therapist, a speech therapist and four horse-riding teachers, in addition to their collaboration with paramedics.